Google has been often accused of promoting its own services in Google Search. Whether it was Google News, Image Search, Product Search or Video Search, the specialized search engine showed results from all over the web and not just from Google's own services. Image Search wasn't restricted to Picasa Web Albums, Video Search wasn't restricted to YouTube, Blog Search wasn't restricted to Blogger. Even for services like Google Dictionary and Google Finance that have their OneBox at the top of the Google search results, Google shows a list of other relevant services. Google's special section that shows people and pages from Google+ doesn't look like a regular Google OneBox. It's placed in the right sidebar, where Google used to display ads. It shows up for general queries like [music], [sports], [math], that aren't typically associated with social search results. It only shows results from Google+, not from other social services like Twitter or Facebook. It's there even if you're not logged in using your Google account or you're not using Google+. 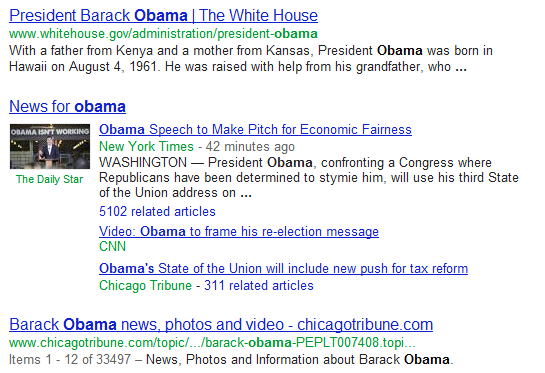 Google already indexes profiles from different sites and even shows special snippets with structured data. Why not create a special search engine for profiles like the one that lets you search recipes or the search engine for applications? When Google released Knol, many people wondered if Google could boost the rankings for Knol articles or create a special OneBox with Knol results. "Google Knol does not receive any sort of boost or advantage in Google's rankings," replied Matt Cutts and he was right. Now what if Google displayed a Knol OneBox at the top of the search results for queries that returned relevant Knol articles? Maybe Knol would've become more popular and it wouldn't have been discontinued. Is it fair to promote results from a single service, especially when you own that service? Even if those results are comprehensive, relevant and useful, it's always a good idea to also show results from other services. The results are better simply because you can check the accounts from other social services. Maybe an artist shares more information on Twitter or maybe the Facebook account is more important. "When you search for 'cooking' today, Google decides that renowned chef Jamie Oliver is a relevant social result. That makes sense. But rather than linking to Jamie's Twitter profile, which is updated daily, Google links to his Google+ profile, which was last updated nearly two months ago," noticed the authors of the Focus on the User site. I still don't think that the social search box should be placed next to the results, but at least the tweak made it more useful. Google services seem to be getting hindered with the company's increasingly desperate attempts to push Google+. 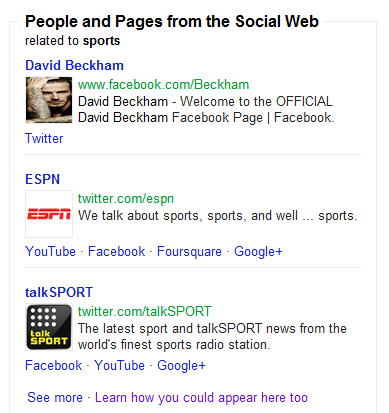 Search results need this bookmarklet to provide info on services everyone uses (FB and Twitter), while services like Picnik, which had tie-ins to FB and Flickr, are being discontinued and the features promised in a Google+ only service. This latter example reminds me of the demise of Google Gears which was obviously intended to remove services from competing browsers, even if a Chrome-only offline service was still years away from being ready at the time. Google Search up until now has been bullet-proof from any such pushing of other Google products. Obviously no longer. The trouble is, they can push Google+ all they like, but if people aren’t finding their friends and family using it every day as they do the rival networks, aren’t they going to think slightly less of Google Search as a result? Yeah, this doesn't feel like it meets the "Don't Be Evil" metric. Include all of the social sites together and let it compete on merit. If Google+ were to truly become a compelling social play, it would need more of the magic that made Gmail and Maps different from its competitors. And maybe that differentiation is the ability to plug into and tap the power of the other social media sites. That's how Google got big - it helped you find exactly what you were looking for and did it better than anyone else. Why can't Google+ do the same thing, regardless of where the actual content lives? If I could plug in my Facebook, Twitter, Blogger and Google Reader into my Google+ feed, I would in a heartbeat. RE: regardless of where the content lives? The problem is that if Google allows a closed internet to develop than it won't be able to find "exactly what you were looking for". Google can't do the same thing with Facebook and Twitter because both of those companies refuse to allow me to connect my data to Google's services. I see Google's integration of Google+ into search as a way to either prevent Twitter and Facebook from keeping our data in their silos by encouraging users to switch to Google+. Alternatively, it is a play that may compel those services to grant users the ability to use their data in Google social search, as they already allow with Bing. "help you find exactly what you were looking for and did it better than anyone else"
And it if they achieve this goal in a year from now -- which for business reasons they cannot today -- then you might be willing to use their service in a heartbeat then. Hey, it's Google's product and they can do what they like. They have a right to promote Google+ this way. However even as a Google+ user (or at least I attempt to use it but nobody else wants to), I don't like how they are throwing Google+ in our face everywhere and messing things up along the way. As much as I hate to say this, I am seriously looking at moving to alternatives to some of Google's products as they irritate me more each week. I have always loved Google but they seem to be doing some things wrong right now, in my opinion. It is their service, so it's totally understandable that they want their service to be the first option for the users. Although some people may find it a bit unethical. But its Google, not much we can do about that. Why do you think people believe it is unethical? I'm trying to figure this out, but most of the arguments that have been echoed by the valley journalists do not make sense to me. First /. comment: "So tell me, why Facebook data isn't open for everyone? That's control too, isn't it?. And do you remember when twitter said "no" to Google for use Twitter data on Google Social Search? " Exactly. This bookmarklet by a Facebook engineer distracts from the hypocrisy of Facebook's and Twitter's position. Focus on the User is well-intentioned, but I'd rather have a bookmarklet that disables the "suggested users" box altogether. I don't think focus on the user is well-intentioned at all. I agree with you, Alex. Let the content determine the results, not the prejudices of the search provider. I disagree with you Roger. I think Google should take a stand against Facebook's and Twitter's positions because both service do not provide federated social solutions or meaningful data liberation (there is not easy way for me to use my data from Facebook in Google search as I would like). By pushing Google+ in a way that integrates with search they may undermine the value of Facebook's walled garden. I believe that this move is in my medium term interest as a user. However, it would be awesome if we all adopted genuinely open social solutions in the long term. Google didn't "used to" display ads in the right sidebar - they still do! The right sidebar has always been reserved for sponsored results which is why it's meritless to be complaining about G+ pages being promoted there. Although I agree that the complaints are ill-founded, I'm not sure I agree with your reasoning here. Google should point out when something is an advertisement, whether for its products or others. A different way to look at this is that Google has promoted some services in the past, such as Google Maps. Many people have accepted this because Google's products have in fact been the superior and many remain so. Some would argue that this latter logic does not hold true. I am, however, happy with their promoting Google+ in the same way they promote Google Maps because it seems to me that Google as an entire product is stronger with an integrated identity service. There are other reasons why I believe it is acceptable, but if it was an advertisement it should be labeled as such. "Fair" has nothing to do with it, and shouldn't, you could search elsewhere if you like! 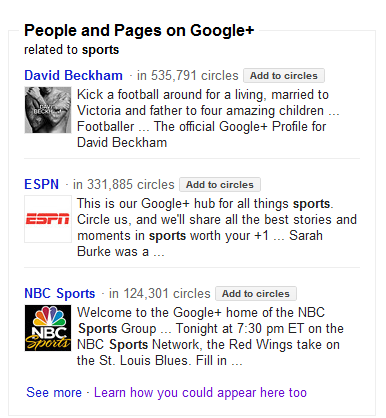 G+ is part of search like many products soon would be. It's all one product that's the goal. Exactly David. I wouldn't be surprised if my Google Docs results, etc... were integrated at one point. And this is why it is imperative to have Google+ favored; it is, as Eric Schmidt said an identity service. What this suggests is it will enable to sharing and searching of Google Docs perhaps even Gmail right in social search. The main difficulty with incorporation other services (Facebook and Twitter and the like) into such a framework is that both of those services were unwilling to allow permissions and friends etc... to be connected to Google search. I would love people to imagine what this social search could become, rather than focusing on what I believe is a red herring about search bias. Anonymous: Your arguments would carry more weight if you'd step out from behind the mask. I hope that my arguments carry no more weight than their soundness, independent of my identity (in the same way that a mathematical proof is correct or incorrect independent of the mathematician). When Facebook and Twitter learn to share then perhaps they would have a point. Plus I think the reason Google did not integrate is because they have a whole pipe line of future updates they will implement needs far deeper integration that Facebook or Twitter would ever allow. Both of those upgrades to the service would just be Google continuing down the path of giving users direct answers to their search query. For example reading a brand page posts directly in Google search results. Being able to view elements of a person profile that is relevant to your search results directly from the search page, an example is if you search for Thomas Hawk, the most likely reason will be to look as his public photos so they will allow you to simply browse through his photo albums on Google+. It hard to see Facebook or Twitter to allowing this type of integration. I’ve learned a lot from your blog here! Keep on going, I will keep an eye on it. What a bunch of despicable whores and shills you people are. Suggestion for Google apologists who want to make the world a better place: swallow a shotgun. Do you have more suggestions? I'd love to hear. I also think that Google shouldn't point to Facebook in social search results unless there is genuine integration as there is with Bing. What Google is doing here is tricking people into joining its social networking site so that it came increase its members and possibly use that as a way to get more advertising money. Alex did you watch last week's This Week in Google? I think Matt Cutts was on to discuss this. I really like it, perfect integration. Unethical? I don't know, its their product, you don't have to use it. You can take all with Google TakeOut. Do not want FB. I think data liberation is key to this debate. If Google didn't have the data liberation efforts, I definitely agree that it would be unethical. But they do, so I'm happily using it. This really sounds like hyperbole, Sterling. Indeed, the social search results feature Google+ in several ways encouraging users to sign-up, but the sign-up process for Google+ is presented in a transparent manner. personally, I don't care either way. from what I know, they (social media sites like facebook/twitter) are all flawed. I personally use facebook currently, for a few reasons. my break with myspace was because even with help topics there were things I simply couldn't figure out for personalization. I tried twitter, but I'm not one for sound bites. they feel cheap and one dimensional, so I only used it for about a week. Facebook, now I'm having issues because it gives the option to create the group "family" but it never comes up in the personalization features, like if I post something I have the option of making it available to "close friends", "friends of friends", or "public"- no where does it include "family", and half the people on my page are family members - but aren't in my "close friends" group, just in "family". The trouble is, they can push Google+ all they like, but if people aren’t finding their friends and family using it every day as they do the rival networks, aren’t they going to think slightly less of Google Search as a result?